Cameron DeMange, who just turned 4, enjoys rolling out blue Play-Doh before making animal figures from it by pressing patterns into the modeling compound. Prior to the activity Tuesday, he listened to Clinton-Massie Branch Library Director Kat McKay present two illustrated children’s books, “Dave the Potter: Artist, Poet, Slave” and “Colorful Dreams: The Story of Artist Henri Matisse”. 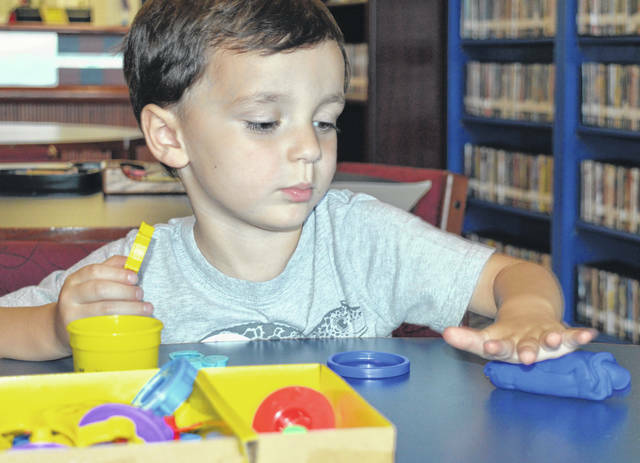 Story time for all ages is held weekly on Tuesdays at 11 a.m. in the branch library on Lebanon Road.